The MIPS P5600 delivers industry-leading 32-bit performance with class-leading low power characteristics in a silicon footprint significantly smaller than comparable alternatives in the industry. The P5600 CPU core was designed for the performance and features required for mainstream consumer electronics including connected TVs and set-top boxes, and the rich, broad feature set extends its applicability into a variety of networking applications from residential gateways to network appliances, as well as high-performance compute in embedded applications. 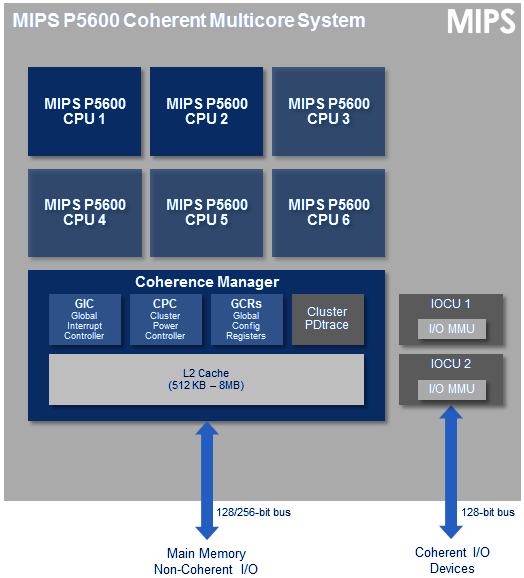 The MIPS P5600 CPU is based on a wide issue, deeply out-of-order (OoO) implementation of the MIPS32 architecture, supporting up to six cores in a single cluster with high performance cache coherency. Complementing its raw horsepower, this core also includes 128-bit integer and floating point SIMD processing, hardware virtualization, and physical and virtual addressing capability enhancements. 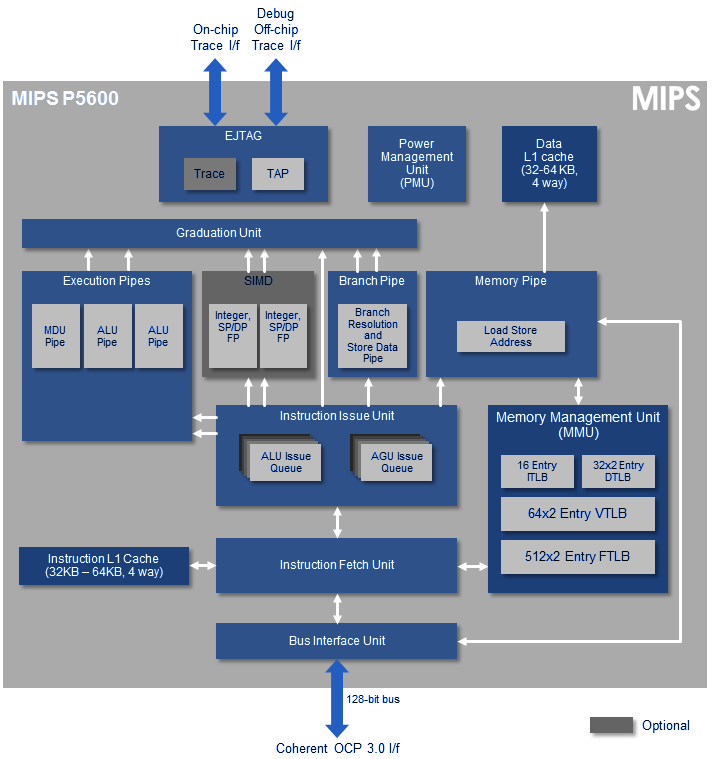 The MIPS P5600 processor IP core delivers top line performance while being the most efficient CPU core in its class, making it ideal for a wide range of applications in the rapidly growing connected consumer electronics market. The P5600 builds upon the existing proAptiv family microarchitecture, adding 128-bit SIMD, hardware virtualization with hardware table walk, 40-bit eXtended Physical Addressing (XPA), and substantial gains in performance on system-oriented software workloads. The P5600 CPU also achieves 5.4 CoreMark/MHz per core, and 3.5 DMIPS/MHz, matching or exceeding other high-end CPU IP cores. The P5600 processor delivers this performance in a much smaller silicon footprint than leading IP core alternatives, achieving these results in up to 30% smaller silicon area, given a common process geometry, similar configurations and synthesis techniques used. SoC designers can use this efficiency advantage for significant cost and power savings, or to implement additional cores to deliver a performance advantage against competing silicon. Notes: Frequencies indicated are based on pre-production P5600 RTL and compared with results for fully floorplanned dual core proAptivimplementation, and range from 12T SVt area-optimized in worst case silicon corner, to 12T MVt speed-optimized typical corner silicon. Final production RTL results may vary.